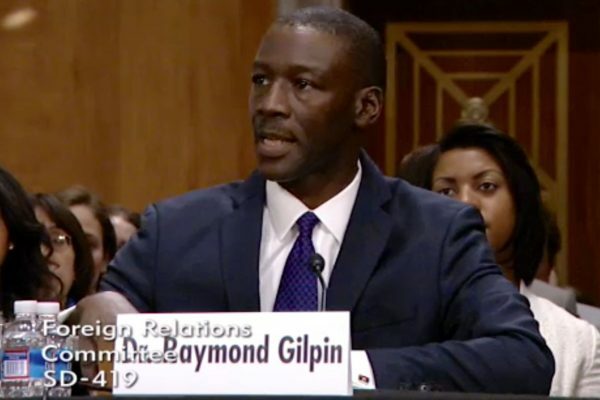 Dr. Raymond Gilpin, Dean of the Africa Center for Strategic Studies, testified before the Senate Foreign Relations Committee on “Prospects for Peace in the DRC and Great Lakes Region” on February 26, 2014. Others testifying included diplomats Russell D. Feingold and Roger Meece, and actor/director/activist Ben Affleck, who seeks to raise international awareness of the issues. The Africa Center’s Dr. Gilpin described the conflict as a persistently complex emergency, characterized by collectively-reinforcing factors such as: a perverse political economy; extremely weak governance at all levels; trans-national political, financial and inter-group dynamics; and a persistent war economy. Focusing on the economic dimensions of peacebuilding he noted that it is time that the 76 million inhabitants of the DRC believe that the peace process is about them, and not just about threat reduction or a string of economic development projects. He called for strategic responses that are both population-centric and longer-term in nature. These should combine security, diplomatic and economic assistance, judiciously. Engagement with civil society should also be prioritized, and must not start and stop around peace deals. Other panelists were: The Honorable Russell D. Feingold, U.S. Special Envoy for the Great Lakes Region and the Democratic Republic of Congo; The Honorable Roger Meece, Former U.S. Ambassador to the Democratic Republic of Congo and Former United Nations Special Representative for the Democratic Republic of the Congo; and Mr. Ben Affleck, director, actor, writer, and producer, as well as founder of the Eastern Congo Initiative. The Africa Center’s Dr. Gilpin said that much more could have been done with the $25 billion the (DRC) has received—in humanitarian and official development assistance—over the past decade. Dr. Gilpin also insisted on a “3D’s” approach—Duration, Diversification, and Dialogue—to the challenges in the DRC. Duration: Engagement in the DRC must be conceptualized from a long term prospective. Dialogue: Dr. Gilpin pointed out that the international community’s engagement must go beyond peace deals. Measure should be taken to more effectively institutionalize consultation and communication at all levels, as a way to foster dialogue and ownership both at local and national levels of government. As for the U.S. Government, Dr. Gilpin said it could do many things to foster sustainable peace, shared prosperity and democratic governance in the DRC. “The first [thing to do] is a logical extension of Sections 1502 and 1504 of the Dodd-Frank Act,” he said, referring to sections of the 2010 law that address conflict minerals and natural resources. He pointed out that a well implemented Dodd-Frank Act could facilitate the use of the DRC’s mineral wealth for the benefits of its people. In addition, the United States could help sustain interest and engagement in the opportunities the DRC presents for economic progress and sub-regional stability, Dr. Gilpin said. In that regard, priority should be given to long-range and interagency plans for stability and progress, as well as the institutionalization of regular updates. “Given its size, location and potential, the DRC is of immense strategic value in this sub-region and beyond,” Dr. Gilpin said. The Senate hearing was meant to shed light on ways to end the violence in the Democratic Republic of Congo. Over the last two decades, the estimated death toll in DRC has ranged between 3 and 5 million people killed and hundreds of thousands more displaced. Panelists’ testimony ought to help answer several questions, to include: How can the U.S. government best continue to support regional and international efforts toward peace and stability in the African Great Lakes Region?